Chewy Almond Lemon Bird’s Nest Cookies are everything their name describes. Right out of the oven they are a little crunchy, but as they cool, these cookies magically become delightfully chewy. So how about those toppings? Have you ever seen any cookie more realistically named as bird’s nest? 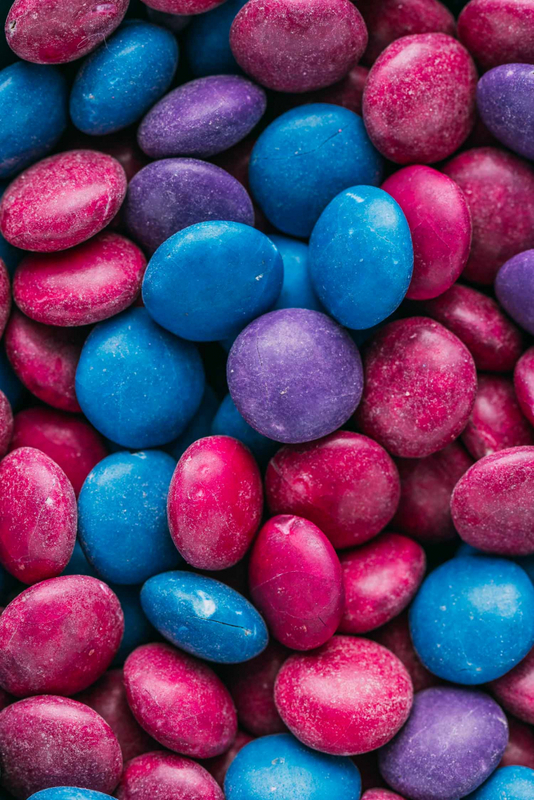 The pastel-colored candies by Unreal add just the right touch. This unique candy tends to crack just a bit during baking. We think that the delicate cracking adds to the appeal. A while back, some cookies we saw on The Food Network inspired the exploration that led to this post. Also, whenever we begin to work on building a new recipe, we dig in and explore what others have discovered. 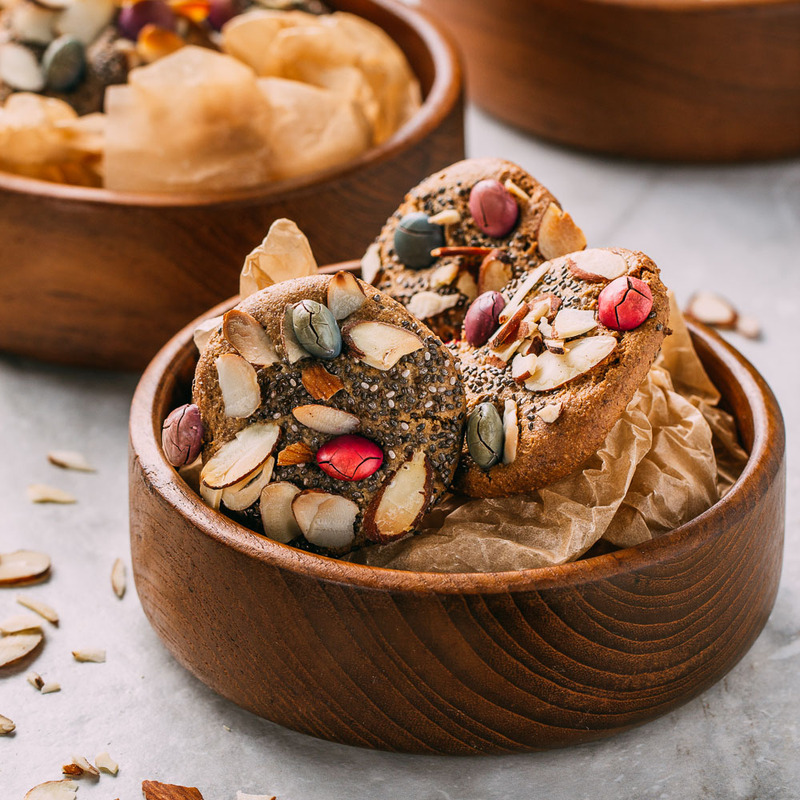 For our Almond Lemon Bird’s Nest Cookies, an oatmeal cookie recipe by Forks Over Knives did the trick! Now and then we like to mention how we come up with new ideas. We want to inspire you to explore what interests you. 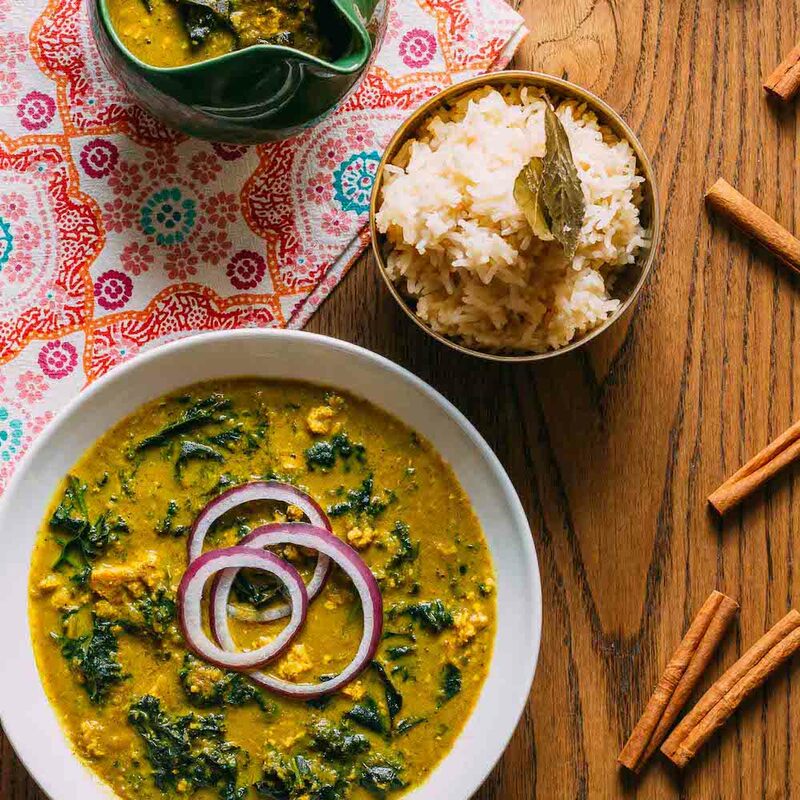 While many of you have every ingredient in your pantry ready to go when you see a recipe that sounds inviting, some of you rarely try new dishes. We want to encourage you. You are not alone; we’re in this together! We try new things when we genuinely want to experience triumph in the kitchen. One thing that nudges us in the direction of exploring new recipes is the fact that we write and share recipes, so we need to try new methods. However, the other thing that helps us be willing to be a bit adventurous in our cooking is to read recipe posts that help us figure out a few things we can count on to work out. The addition of lemon juice to vegan and gluten-free baked goods is one of those read about, explored, and eventually learned things for us. Before growing our understanding and experience of how flavors work together, especially in vegan and gluten-free baking, we would have never thought to add lemon juice to dessert other than lemon bars. So now look at us! When you read through our recipes, you’ll find the inclusion of lemon juice all over the place! Two of our favorite recipes where we use lemon juice in ways that we adore is in our Oil-Free Mayo and our gluten-free, vegan, oil-free Banana Blueberry Chia Seed Muffins. 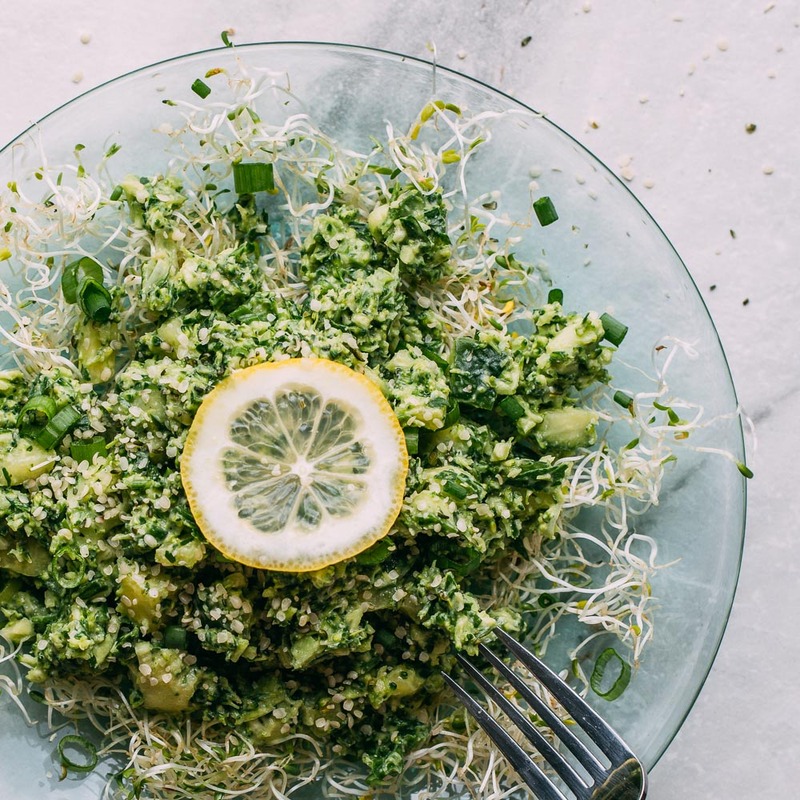 We also use lemon juice in our favorite lite 5-minute alfredo-style pasta dish, and in our opinion, lemon juice is what makes our Kale Salad stand apart from the crowd. 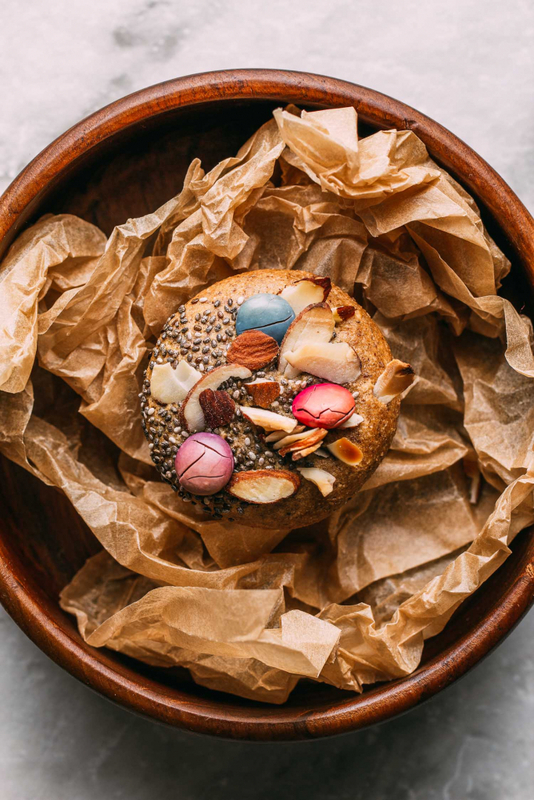 But that’s enough about the wonders of our juicy best friend kind of ingredient, let’s get on to discussing these newest beauties that we’re playfully calling our Chewy Almond Lemon Bird’s Nest Cookies. 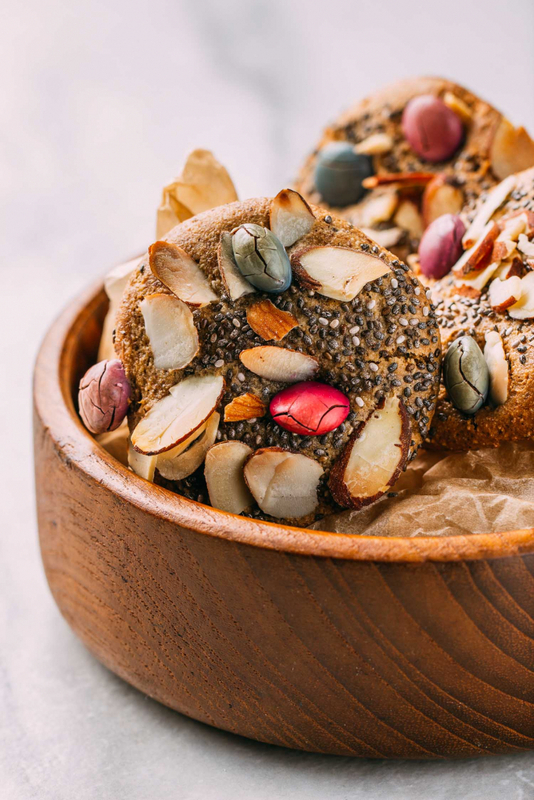 Like we said in the opening paragraph, Chewy Almond Lemon Bird’s Nest Cookies are everything that their name describes. The chia seeds scattered on the top looks realistic since its nearly impossible to get chia seeds to behave any way other than organic. By that, we mean that chia seeds go where they want to go and stick where they want to stick. The almonds remind us of how birds hunt and incorporate random pieces of this or that to build their nests. So in a bird-like manner, we let the almonds land where they might, and we used chipped pieces as well as a whole, nicely shaped slivers. So as for the Unreal brand of colorfully coated chocolate candies, as we said before they bake and crack in nest-like perfection! We cannot look at these cuties without wishing to share one with Martha Stewart Living Magazine. To us, Chewy Almond Lemon Bird’s Nest Cookies are everything that Martha’s magazine covers inspire. These cookies embrace and celebrate nature and the abundance of “good things” it has to impart. So how do these plant-based cookies taste? Chewy Almond Lemon Bird’s Nest Cookies taste like a walk in the woods on a crisp Spring day. The lemony hit of fresh juice in combination with the pure maple syrup is just something you must try! Also, the nutty tahini in place of flavorless fat and oils is a spot-on winning move. 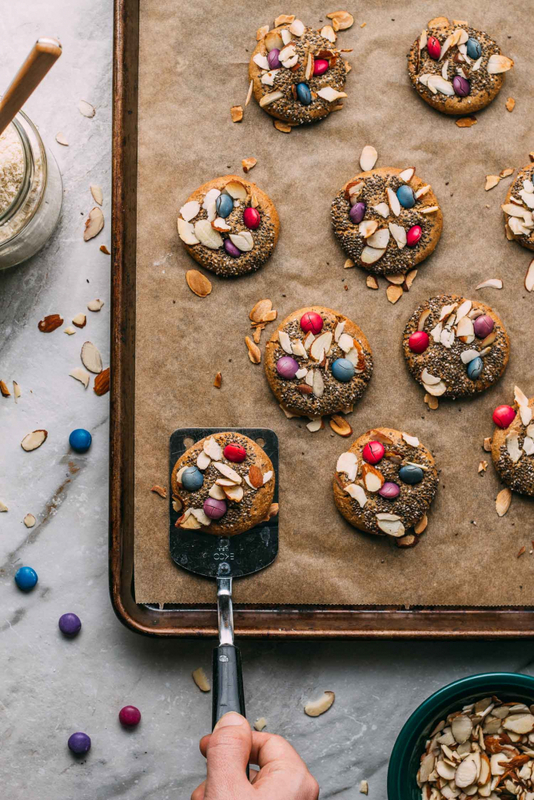 The chia seeds in the batter and on top add just enough crunch to make every bite of these chewy cookies interesting. Also, the small portion of tapioca flour included here is something worth repeating. It’s the tapioca flour that lends that fun chew. We always like to close with saying thank you for reading. Also, we want you to know that your progress in exploring and cooking healthier foods is why we do what we do. When we set out on the path of discovering a plant-based, vegan lifestyle, we looked to others to help us find our way. That’s why we intentionally take a moment to encourage you to share our recipe posts wherever and however you can. Right this very minute, you can bet that folks are waiting to follow your inspiring lead. 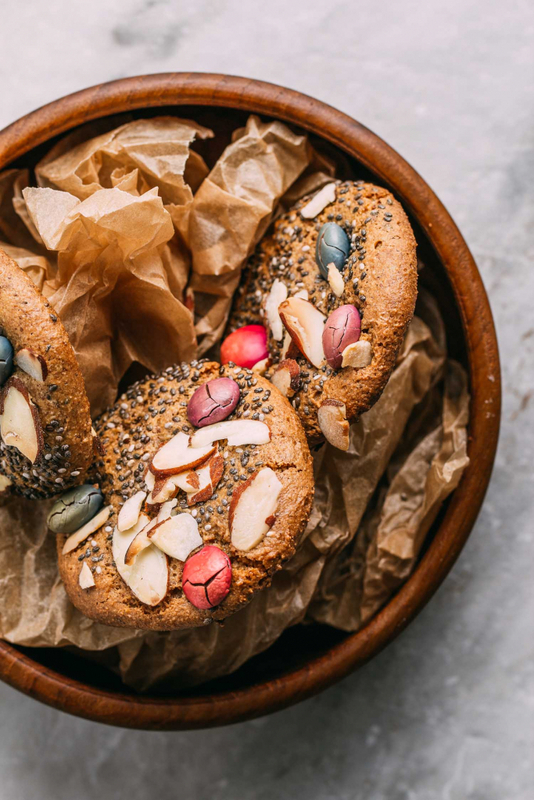 These wonderfully chewy, almond and lemon flavored bird’s nest cookies are bursting with “egg-cellent” flavor. The playfully festive pastel colors of the candies are adorable to look at, and furthermore, these cookies have perfectly balanced taste and texture! These are cute enough to serve to young guests, and they go a long way in pleasing kids at heart. Also, and possibly better still, these tasty treats are easy enough to whip up whenever a cookie craving hits. Also, and possibly best of all, these naturally sweetened treats are plant-based, vegan, gluten-free, oil-free, and dairy-free! 1/4 cup of unrefined coconut sugar, date sugar or maple sugar - We used this brand of coconut sugar. 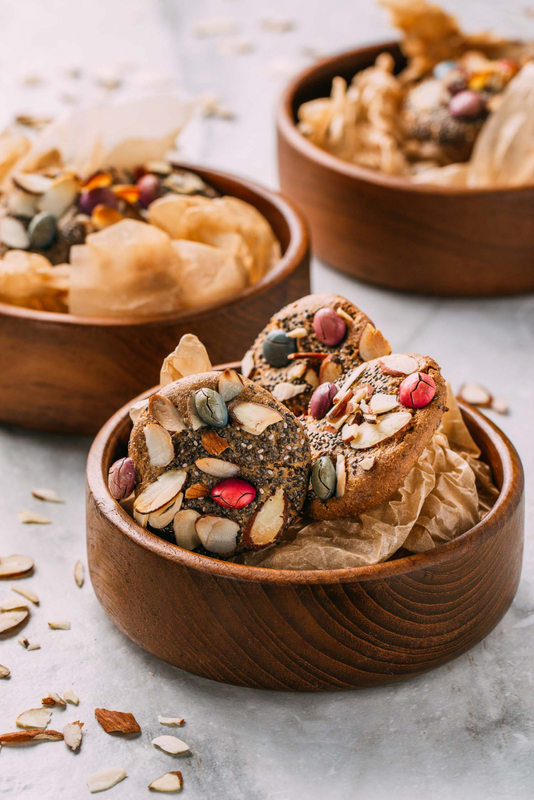 1 tbsp of freshly ground flax seeds or flax seed meal - When possible, we prefer to use whole flax seed that we grind in a spice grinder to obtain the most nutrients. 1/4 cup of tahini - In this recipe, we used this brand of raw organic tahini. We often use this other brand of organic sesame seeds but we were out... most any tahini should work just fine in this recipe. 1/4 -1/2 tsp of salt - We like to use pink Himalayan sea salt. 1/4 cup of tapioca flour - See notes for possible substitutions. about 48 pieces of colorful vegan candy-coated chocolate candies - We used this vegan and gluten-free variety by a brand called, Unreal. We estimate 3 candies per cookie. Begin by preheating your oven to 350º F and line a large baking sheet or two with parchment paper or reusable silicone baking sheets. In a separate large mixing bowl, food processor or blender, combine the sweet and wet ingredients: unrefined coconut sugar, ground flax seeds, water, tahini, nut butter, maple syrup, vanilla extract, almond extract, lemon juice, and salt until very smooth. It should taste excellent at this point, but remember, the dry ingredients are still coming! Next, in a separate mixing bowl, combine the dry ingredients: almond flour, tapioca flour, one teaspoon of chia seeds and baking soda. In a mixing bowl, stir the dry ingredients into the wet until well combined and a sticky dough forms. Chill the dough in the fridge for about 10-25 minutes. Chilling time for this dough matters since chilling helps you deal with the stickiness of the batter. Even after a good chill, this dough is sticky... do not skip the chilling time. We chilled our dough for about 20 minutes. We found it helpful to portion out the cookies first before adding any toppings since the dough is quite sticky. We also found it beneficial to chill any portioned out dough that does not make it into the oven due to spacing. 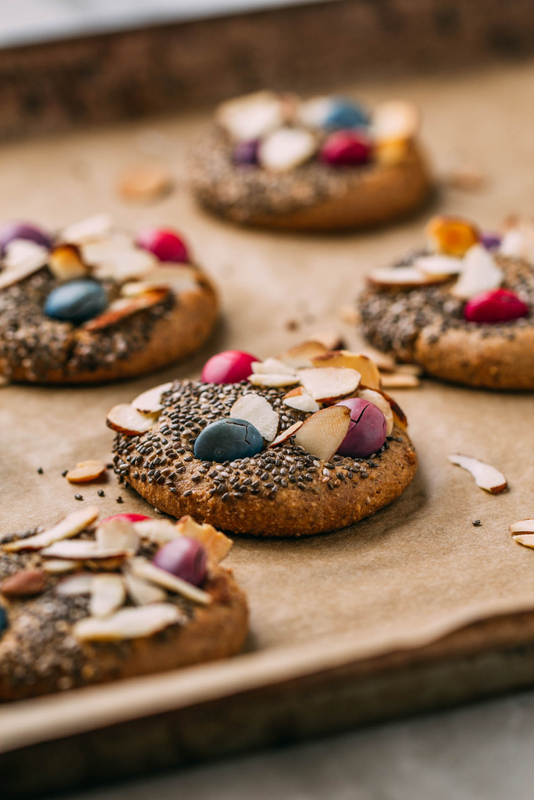 Now it's time to arrange the chia seeds, sliced almonds, and candies on the cookies. 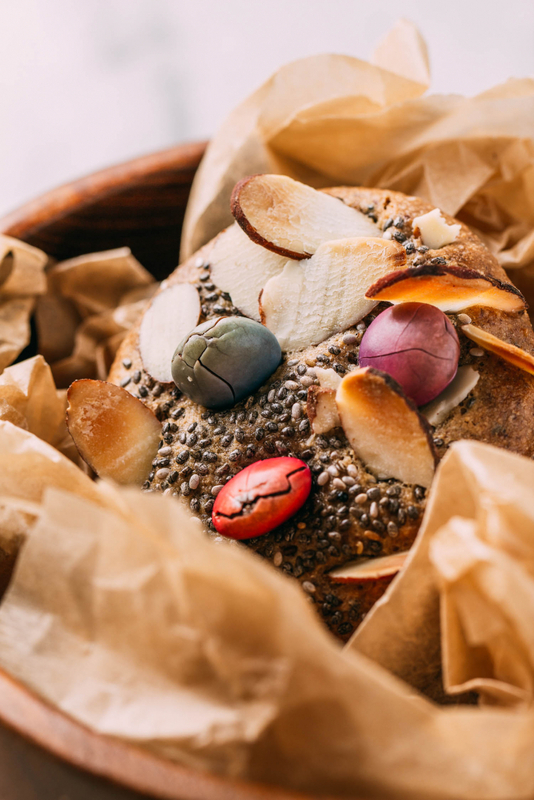 For the chia seed part, we just pressed the tops of one side of each ball of dough into a small bowl of chia seeds. We then set the chia adorned balls of batter about two inches apart on a parchment-lined baking sheet. Next, use a slightly wet bottom of a glass to gently press the cookie down just a tad before pressing a few almond slices and coated candies into the top of each cookie. There's no need to push down too hard as the cookies will melt and spread on their own quite nicely. Bake for about 11-13 minutes total until set and lightly browned. Once lightly browned, allow your adorable cookies to cool on the baking sheet completely as they’ll be a bit soft. Once cooled, transfer them to wire cooling racks to rest. You might think the cookies seem crisp or hard, but as they continue to cool, you'll notice that they change in texture and become quite soft. These cookies taste best stored at room temperature. After you're sure they've cooled completely, you should store these deliciously soft and chewy cookies in an airtight container at room temp or in the fridge, if you like, to extend freshness. We tried a batch of these where we added the candies at the very end of the baking time to avoid the cracking but ended up preferring the cracked look. You may add the candies whenever you like, but they do bake nicely. As an alternative to the Unreal candies, you could opt to use either cacao nibs, vegan chocolate chips or leave the chocolate out entirely. And speaking of cacao nibs, we recently read in one of our Facebook groups that cacao nibs taste terrific when ground and brewed with coffee beans. We'd like to try that as a treat sometime! As mentioned above, chilling the dough makes it easier to work with so it is highly recommended. Although we did not try it, we believe that either arrowroot powder or cassava flour could replace the tapioca flour if need be. In case you aren't familiar with tapioca flour, tapioca flour can add some great rising power and fluffiness to gluten-free baked goods. The texture of tapioca also helps gluten-free baked goods have a slightly elastic texture, even without gluten! If you ever care to purchase organic tahini in bulk which is nice for those of us who make hummus by the boatload, this is a terrific value. Tried this reciepe today, super awesome -just the right amount of sweetness . I baked them for 15 mins at 350 & for another 15 mins. on 200 coz i like crunchy & crisp cookies. Perfect-Thanks. Thank you for recognizing these cookies as having just the right sweetness, Alpana. And for sharing how you baked them a bit longer to have them be crunchy to your preference. Also, it was so kind of you to take a moment to write and share your thoughts with other cooks and readers; thank you all around! Thanks Renee, we are hooked, another batch is going into the oven. That’s so cool to hear… thank you for sharing your repeat try of this recipe, Alpana. We made multiple “trial” batches even after we got the method where we wanted it… these cookies are THAT kind of good. So glad you’re enjoying it!